Crumbling Ecologies Catalogue Essay, Craft 2012. Across the nation art schools are re-evaluating the need and demand for crafts such ceramics, glass, woodworking and jewellery. 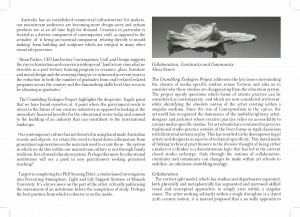 Such courses are experiencing restructuring, merging and fatal closures; the dilution of teaching pure craft techniques at a tertiary level will have a profound effect on the visual art, craft and design communities. Melbourne based artist Jasmine Targett began her project by tackling the Monash Caulfield campus' craft restructure and in doing so discovered a national community supporting her concerns. The Crumbling Ecologies Project opens a discussion surrounding the condition of environmental conservation and craft education within Australia. This predominantly ceramics-based exhibition symbolises the crumbling of a community and the struggle to sustain an industry in the absence of a training infrastructure. 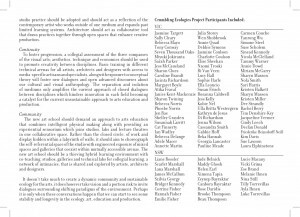 It also stimulates discussion around the meaning and worth of craft and design as viewed by both the arts education system and Australian society. In the gallery space neon wall installations and museum style vitrines feature multimedia works, showing both the breadth of Targett’s practice and the interdisciplinary impact across craft and visual arts of the topics’ material. Navigating the exhibition, the viewer experiences the installation as both a contemporary Museum and gallery space. 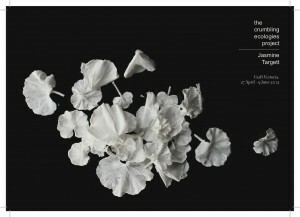 The most literal piece in the exhibition, an installation of ceramic geraniums, sweeps a large portion of the room. Some of these geraniums will be taken home by the audience, and some will be destroyed throughout the exhibition’s duration as a result of audiences navigating the site, which physically reinforces the loss of craft and environmental research funding with a startling crunch. Upon entering the gallery the Weather Barometer, a flickering wall installation of neon and vinyl, raises awareness to the decline and increased risk of extinction to both the geranium and craft. Mimicking the motions of a weather barometer the piece conceptually links financial climate to the closure of Melbourne’s art schools. 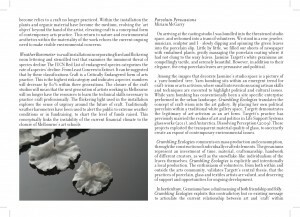 The Beauty of Weeds, fashioned from the Project’s plant waste, sits beneath hand blown glass domes replicating a Botanical exhibit while demonstrating the utilisation of craft within a conceptual art practice. The vitrines are positioned upon tables salvaged and repurposed from an art school, further demonstrating the resilient and transformative nature of craft, able to be adapted to the needs of the user. 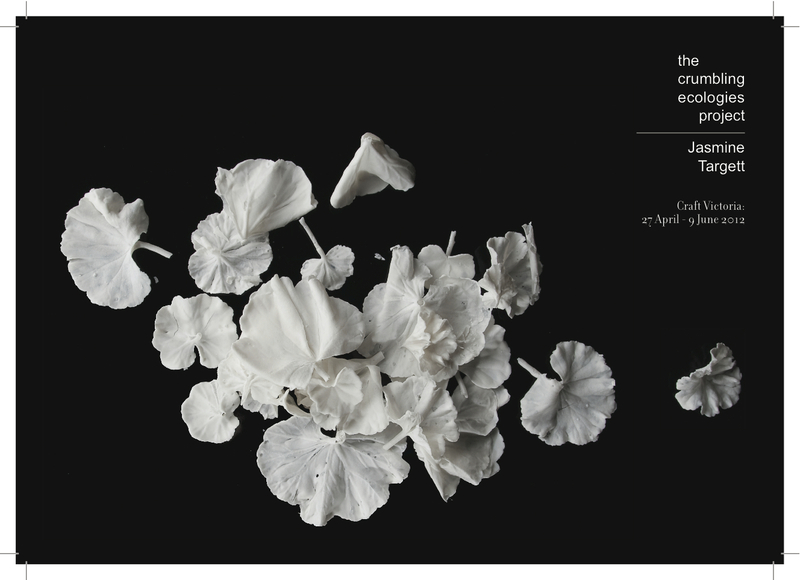 Geraniums are heavily featured in the exhibition, with thousands dipped in ceramic slip and positioned tenuously throughout the gallery. In Melbourne geraniums are a popular commercial plant used to ‘green’ corporate breakout spaces and public gardens around the city. Yet curiously also feature on the Australian National Heritage Trust's Alert List for Environmental Weeds. This mirrors the dichotomy that is Australian Craft; across the country craft courses are being shut down within art schools, despite enjoying a resurgence in Australian creative and consumer cultures. 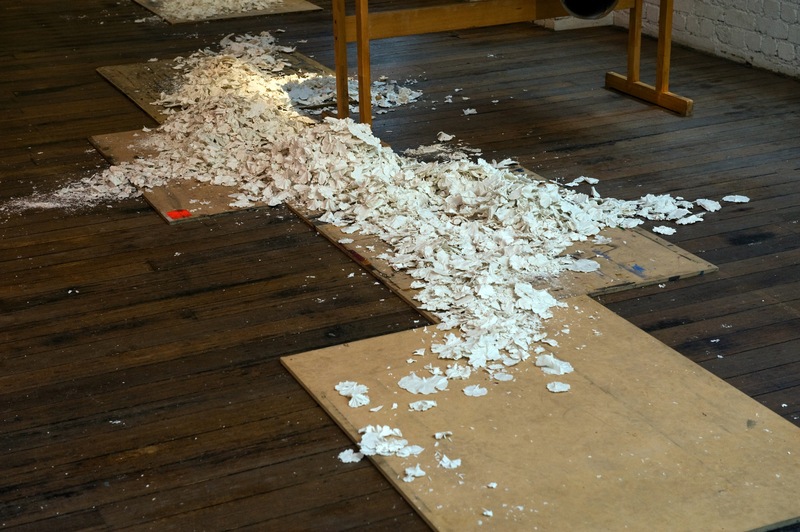 “One key argument used to justify the closure of the craft studios is that these materials and practices have become outdated and no longer relevant to contemporary arts practice and research” says Targett. To claim a material can no longer be researched or utilised is defeatist. Any material incites experimentation, exploration and excitement, how is it that a creative institution can arrive at the decision that a material has reached its potential? In a direct commentary on the strength of the community, the thousands of ceramic geraniums shown in the exhibition have been created by volunteer makers in Melbourne, Bendigo and New South Wales. 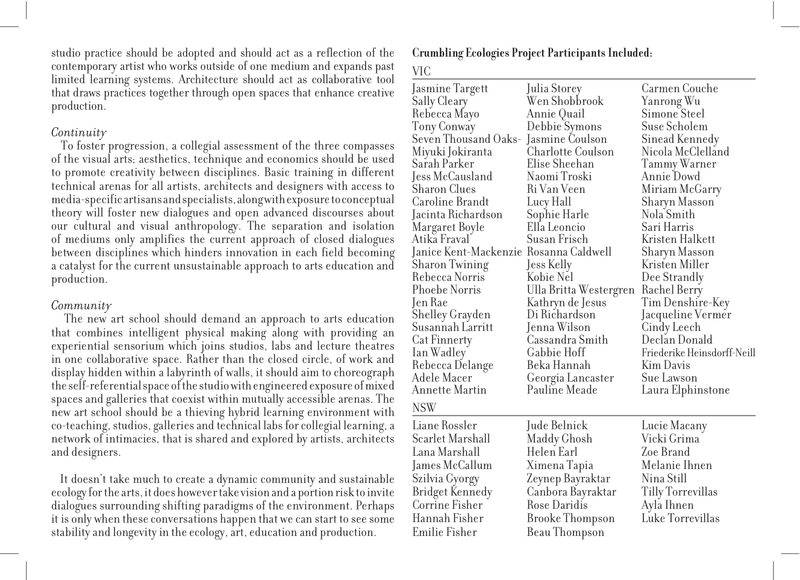 The artists' involvement is a direct display of their concern on how the closure of art school craft studios will impact their future careers and the position of Australian crafts on a national and international scale. 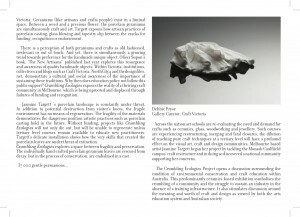 Both contemporary visual art and craft feature a stream of talented young, emerging contemporary visual artists and craftspeople utilising ceramics regularly, if not primarily in their practice. 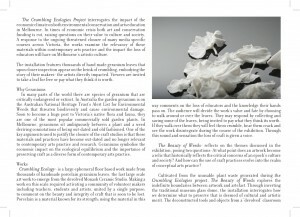 In particular, artists such as Brendan Huntley and Honor Freeman have studied the craft within the last 10 years and have shown in major Australian institutions such as Museum of Contemporary Art, Sydney and National Gallery of Victoria, Melbourne; and both are represented by commercial galleries. This indicates that both commercial and creative audiences continue to see the worth in the varying incarnations of the material. Undoubtedly the upsurge in digital technologies has had a hand in the diminished support for craft in higher education in this country. 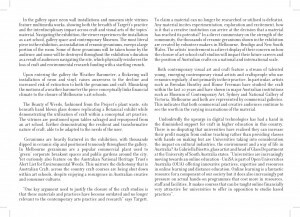 There is no disputing that universities have realised they can increase their profit margin from online teaching rather than providing classes with hands on making, but are Universities taking into consideration the impact on cultural industries, the environment and a way of life in Australia? As Gabriella Bisetto, glass artist and head of the Glass Department at the University of South Australia states: “Universities are increasingly moving towards an online education - UniSA is part of Open Universities Australia (OUA) offering innovative practices, expertise and resources in online learning and distance education. Online learning is a fantastic resource for a component of our society but it does also increasingly put pressure on actual hands-on programmes that cost more in resources, staff and facilities. It makes courses that can be taught online financially very attractive for universities to offer in opposition to studio based practices”. Australia has an established commercial infrastructure for makers, our mainstream audiences are becoming more design savvy and artisan products are at an all time high for demand. Ceramics in particular is treated as a diverse component of contemporary craft, as opposed to the actuality of it being an essential component, relating directly to mould making, form building and sculpture which are integral to many other visual arts processes. 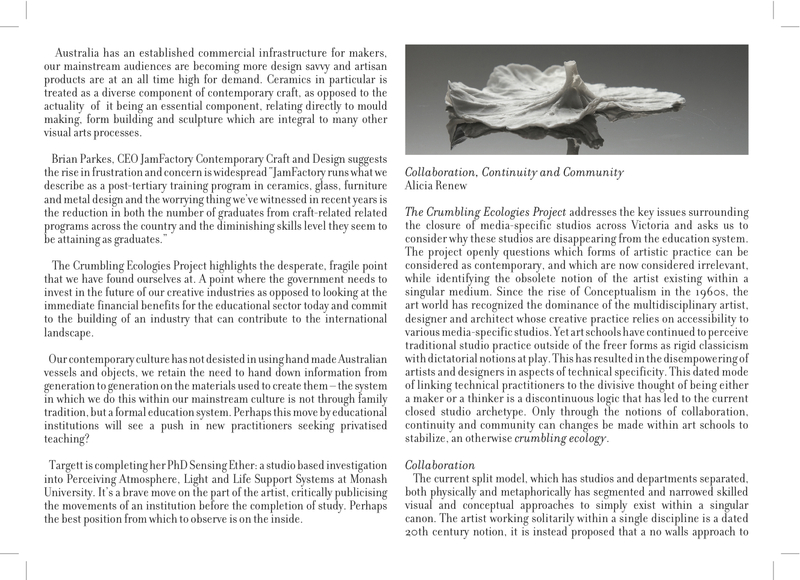 The Crumbling Ecologies Project highlights the desperate, fragile point that we have found ourselves at. A point where the government needs to invest in the future of our creative industries as opposed to looking at the immediate financial benefits for the educational sector today; and commit to the building of an industry that can contribute to the international landscape. 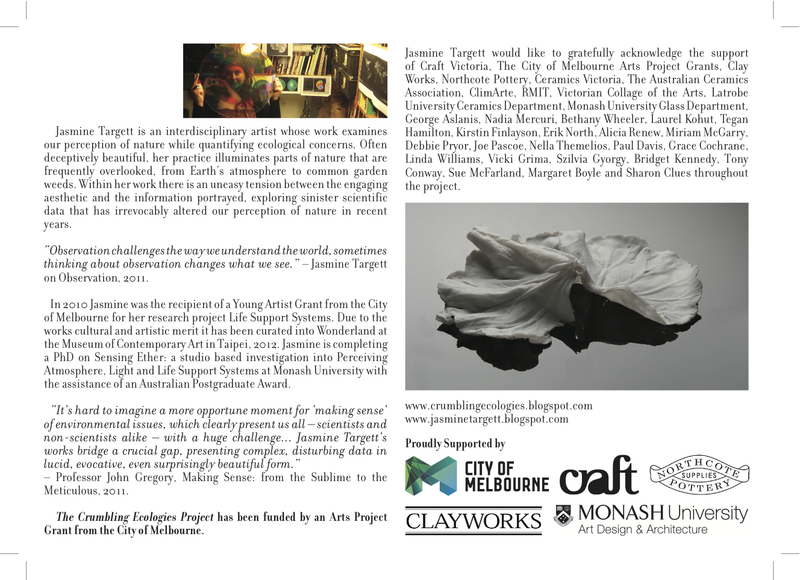 Targett is completing her PhD Sensing Ether: a studio based investigation into Perceiving Atmosphere, Light and Life Support Systems at Monash University. It’s a brave move on the part of the artist, critically publicising the movements of an institution before the completion of study. Perhaps the best position from which to observe is on the inside.